PSI related to trials, other legal procedures, crime statistics or police operations is a delicate category of PSI, which is very powerful but requires special care, so to speak, in handling and presentation. The reason, which is also discussed in the chapter about the dangers of Open Data, is that this is PSI that requires much more context and user preparation than others to be used effectively without generating fear or confusion. One of the proposals for Open Data usage on the data.gov.uk portal is to publish on online maps “where, when and by which power people are stopped and searched, together with their ethnicity and age”. The Economist report on data mentions that in San Francisco citizens already come to public meetings armed with crime maps from the Crimespotting website to demand more police patrols. 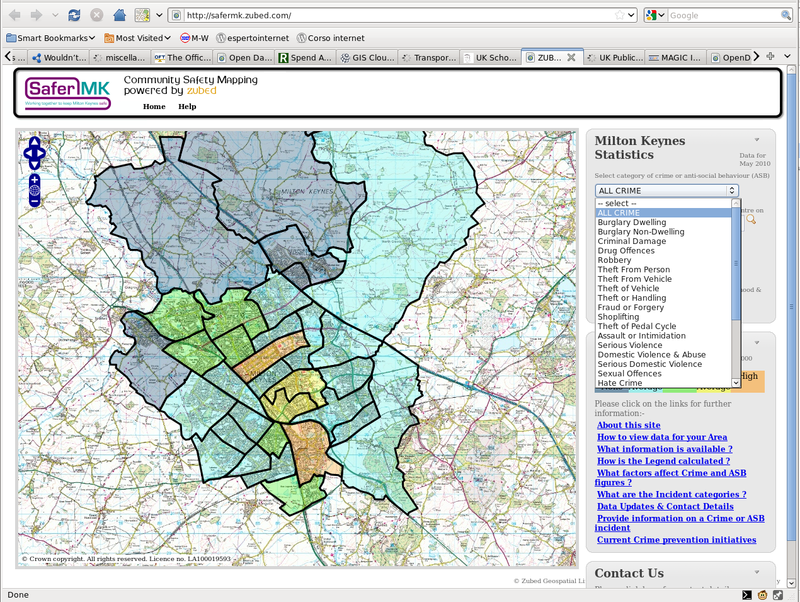 The SaferMK Community Safety Mapping website provides comprehensive crime and anti-social behavior data for every estate, town or village in the Milton Keynes borough. It is easy to see how all these data can help citizens to understand and monitor the effectiveness of law enforcement and public security policies, if they are presented in the right way.